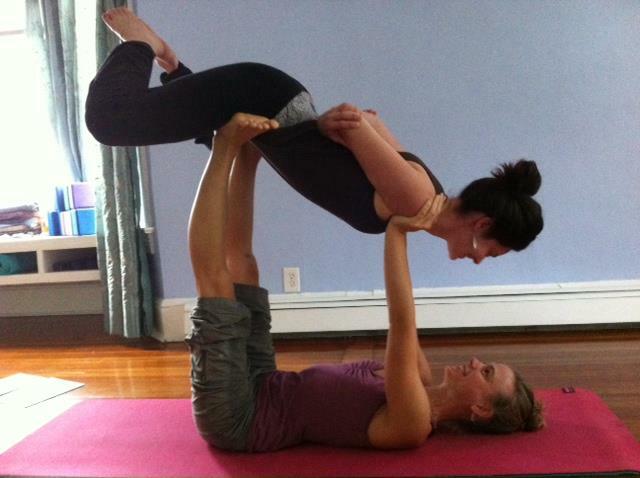 On Saturday I had the opportunity to teach a Tandem Yoga benefit class at the Yoga House in Kingston, NY. I’m so appreciative of the group that came together for this community event at the Yoga House. Special thanks to studio owners Jacqui Potente and Leigha Butler for hosting such a fun experience. This fundraiser was part of the LuvMat Yoga Empowers Project with all proceeds going to Off the Mat Into the World’s Global Seva Fundraiser for Haiti. Seva is the spiritual practice of selfless service, stemming from the Bhakti and Karma paths of yoga. The essence of seva is part of why I enjoy Tandem Yoga, as it naturally illuminates the heart and inspires compassionate action. 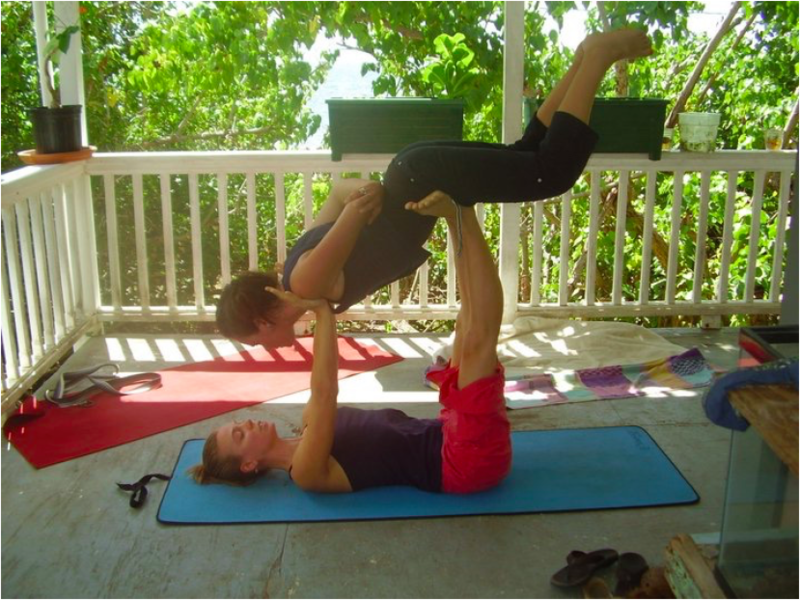 Tandem Yoga is an umbrella term for partner, contact and acrobatic yoga. Through the practice of “balancing Earth and Sky” we explored the relationship of opposition within ourselves and our shared yoga practices. We created a solid foundation through clear communication, safety and support, and balanced this with lighthearted laughter, playfulness and enjoyment of sharing our yoga practices. 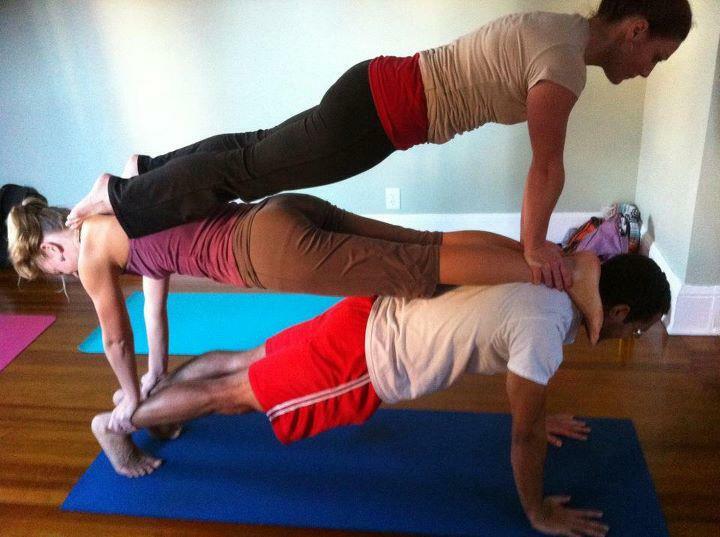 This was an all-levels class and I was especially honored to work with people who were new to Tandem Yoga. The questions and insights that everyone shared were amazing! We talked about the importance of trust and learning to let go, as well as the adventure of “playing the edge” or challenging our sense of limitations. One lady suggested how this practice is great for parties. She reminded me of when I first started teaching partner yoga some ten years ago. To this day I still enjoy “climbing” my friends at parties. I loved hearing about how some of the students plan to share these Tandem Yoga practices with their friends. Thanks again to everyone who helped make this benefit such a great success! I’ve never seen the ocean turn purple before. The sky is a lighter shade of violet smeared with gray clouds and the final sweep of the sunset. Across the bay the islands are beginning to light up. As I’m writing this entry the color of the water changes to indigo. I’m sitting in my friend Sunny’s apartment on St. John. It’s been almost a week since I arrived in the Virgin Islands. The energy of this place is tangible. A few hours ago I ate a bowl of potato leek soup that I helped Sunny prepare. It left me feeling totally buzzed. She asked me if I wanted to go to a party with her. Probably not. So here I am, writing to you and enjoying the sunset. I have to say it’s pretty awesome here. 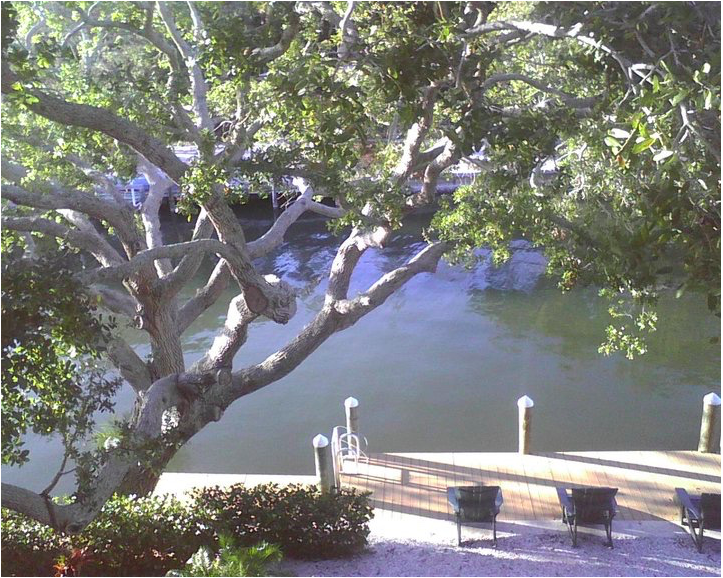 I’ve been practicing yoga every day in Sunny’s kitchen that sits high up overlooking the water. We sit on her porch in the mornings watching the basil and tomatoes grow. Sunny tells me the names of every island in the bay. Hummingbirds and iguanas come to visit us. I am happy… being… here. This is the perfect place to write about chi. I’ve been working as a freelance writer on a book about health and energy practices. One of my assignments is to write about what chi (life energy) means to me. Chi is all around me. It’s inside of me. It’s the feeling of looking at clear turquoise water. It’s the after-effects of hiking up the incredibly steep (!!!) hills. It’s in the sensations in my body when I meditate. It’s the fresh juice from Sunny’s Champion juicer, a sunset swirl of carrot, beet, apple, ginger, lemon. I feel it when I’m laughing. The sky and the water have turned to black. In the distance the hills are glowing orange and white. The crickets are singing and the evening air is soft and inviting. I wish I could practice yoga here with all of you. I’m inhaling another sunset here in the City of Love. For the past month I’ve been awake at dawn almost every morning. This is what happens whenever I’m in the tropics. Before coming here I received a Reiki treatment from my friend Mandy. She predicted that this place would feel like home to me. It has in ways that I didn’t expect. St. John feels like a hybrid of Maine, Hawaii and Colorado. It’s another world here. People drive on the left side of the road which does a number on my dyslexia. There are no fast food restaurants or strip malls. The internet is limited here so I’ve been reading a wonderful book called “The Enzyme Factor – How to Live Long and Never be Sick” by Hiromi Shinya. Very rich food for thought. I’ve taken to calling this trip Sunny’s Island Boot Camp Adventure. We’ve been hiking, snorkeling and stand-up paddle boarding. We practiced yoga with friends and went dancing. Every night is Friday here. Sunny has been teaching me about the history of the island and about the slavery uprisings. 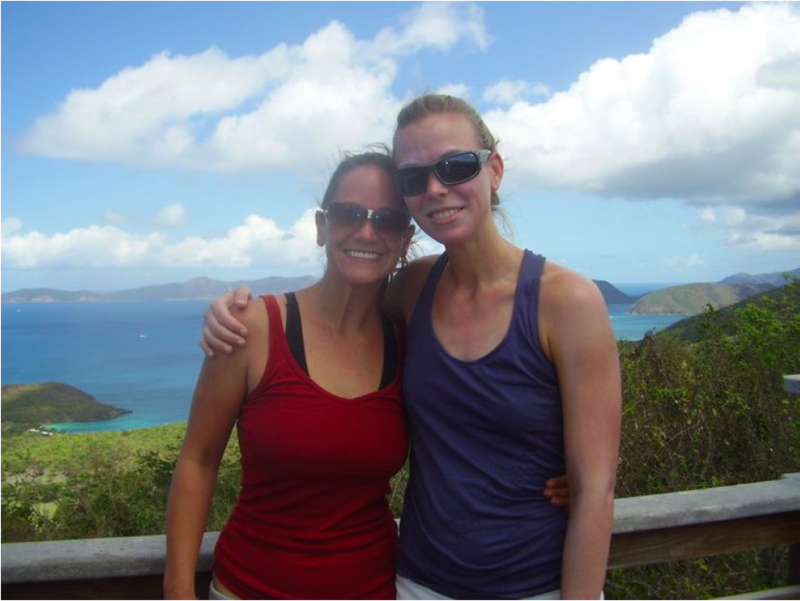 One morning we hiked to a sacred pool on Reef Bay which sits below the largest waterfall on the island. On the rocks surrounding the pool are petroglyph carvings made by the Taino, the early inhabitants of St. John. This was a place of ancestor worship. The petroglyph symbols are positioned to reflect in the water so as to represent the inter-dependency of the spiritual and physical worlds. I wanted to meditate there and will go back sometime when there are less tourists. Three more days until my gypsy caravan moves on. I’m looking forward to coming back. There is an amazing retreat center here and a wonderful community who I would love to continue practicing with. “Your work is to discover your work. I’m just so grateful to have this incubation time. I’ve been able to focus on my projects without a lot of distraction. And I’ve been enjoying the feeling of being in sync with my own rhythms. After being in a fairly solitary space I’ve noticed how much I appreciate human interactions. When I go out for a bike ride I find that I pay more attention to people. I also smile quite a bit. Smiling (like yawning) can be contagious. Riding a cruiser bike puts me in the best mood. I gave up owning a car three years ago. There’s just something so liberating about riding a bike. I started teaching again last month and it’s been wonderful. Giving myself some time off always makes teaching feel much more vibrant. A big part of this is because I’m in a place where I can actually recognize (and act from) my own rhythm. I also have a renewed appreciation for practicing with people. It feels like I’m learning how to live all over again. It’s very much about the baby steps. In the past I would have resisted having so much alone time, but now I can see the value of it. Alone time makes it easier to notice what’s happening within and around me. I have more clarity with navigating the doors that open or close, and a better awareness of when to push or back off. I can trust the ups and downs of life just by accepting that everything is a learning opportunity. It’s in the little things too… like not rushing to drink a cup of tea. Or noticing that I’m not really engaged in a show that I’m watching. This usually means that there’s something else I’d rather be doing. I just have to stop and ask myself what that is. Like not putting on sunscreen before going to a yoga class on the beach and ending up looking like a tomato for a couple of days. It’s all a part of the learning process. I’ve also been enjoying the more subtle aspects of my practice… like unraveling body memory imprints or the messages in my dreams. I believe that we all have an abundance of innate wisdom available to us. One way to start is by opening up to ourselves in a quiet place. This isn’t always the easiest thing to do, so just try noticing when life feels like a routine instead of a practice. I’ll do it too.